On Earth, geological boundaries are accompanied by mass extinctions at five epochs over the last billion years. Two of the most intense of these, the P/T boundary about 250 Mya, and the K/T boundary(and the extinction of dinosaurs) at 65 Mya, are the most likely to be associated with the damage to Earth’s biosphere expected from a major planet explosion. Main belt asteroids come in many types, but most of these are sub-type distinctions. 80% of all main belt asteroids are of type C (“carbonaceous”), and most of the remaining 20% are of type S(“silicaceous”). The former are found predominately in the middle and outer belt, while the latter are mostly in the inner belt, the part that lies closest to Mars. These two types are unlikely to have had the same parent body. 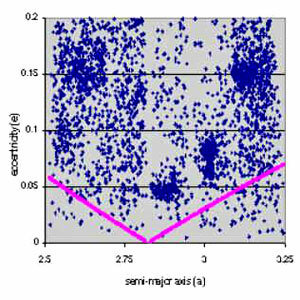 In Figure 2, we show a plot of average orbital eccentricity (called “proper eccentricity”) versus average mean distance (called “proper semi-major axis”) for thousands of main-belt asteroids. We included the numbered asteroids having periods between one-half and one-third the period of Jupiter. If the primeval solar nebula hypothesis were correct, numbers of asteroids with near-zero eccentricity would be roughly equal at all mean distances well away from the orbits of Mars and Jupiter. Indeed, nebular drag and collisions would ensure that orbits with zero eccentricity were preferred. By contrast, if the exploded planet hypothesis is correct, a minimum eccentricity, increasing to either side of a mean distance of about 2.8 au, should be evident in the plot. The “V”-shaped line shows the theoretical minimum eccentricity, according to the eph. for main belt asteroids near theoretical parent planet distance, showing an explosion signature. We see in Figure 2 that, despite about as much scattering across the minimum line as expected (increasing toward Jupiter on the right), the densest number counts trend up and away, paralleling the V-shaped line, on both sides of the inferred exploded planet distance, 2.82 au. It is difficult to imagine this explosion-predicted low-eccentricity avoidance occurring by chance – especially since the primeval solar nebula hypothesis predicts a preference for low eccentricity values. What we are seeing here is Newcomb’s argument applied with modern knowledge and data. The expected characteristic of fragments that originated in an explosion is seen. The expected characteristic of objects present since the solar system’s beginning, even if only collisional fragments thereof, is not seen. Figure 3. Comet energies before (left) and after (right) passage through planetary region. Plot shows number of comets (ordinate) versus energy parameter (abscissa). Astonishingly, a great many comets are discovered that have energy parameter values close to zero, the threshold of gravitational escape, in units where Earth’s energy parameter is –100,000. Before mixing with the planets, a clustering of energy parameters near –5 exists, as shown in the left half of Figure 3. However, as these same comets recede again far from the planets, the clustering property is virtually destroyed, as shown on the right side of Figure 3. The scattering is so great that no clustering near –5 or any other value will exist the next time around. So these comets must have been making their first visit to the planetary part of the solar system. For that reason, they are called “new comets”. These new comets, first noted by Oort, were not the belt of comets beyond Pluto expected by the primeval solar nebula hypothesis. They arrive from all directions on the sky, with no tendency to be concentrated toward the plane of the planets. Also, they move in directions opposite to the planets as often as in directions consistent with the planets. 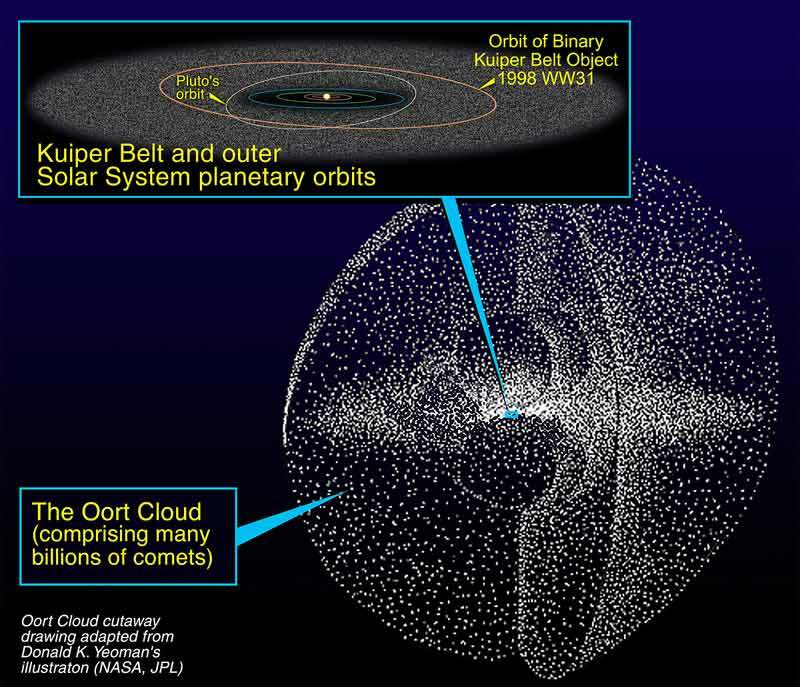 Because of these traits and a mean distance of 1000 times greater than that of Pluto from the Sun, the far-away source of Oort’s new comets was designated the “Oort cloud”. The exploded planet hypothesis predicted something similar. The energy parameter implies a particular period of revolution around the Sun. If a planet exploded “x” years ago, then new comets returning for the first time today would arrive on orbits with period “x”. Comets with shorter periods would have returned in the past, mixing with the planets and eventually being eliminated (or now in the process of being eliminated). Comets with longer periods would not yet have returned for the first time. So the eph predicts that all new comets should have the same period “x”, and therefore the same energy parameter corresponding to a period of “x”. The center of the spike on the left side of Figure 3 corresponds to a period of 3.2 million years, which is therefore the time since the last explosion event. and for classes 1B, 2A, 2B comets (less accurate orbits) on right. In the 1970s, astronomer Opik devised a test to determine if the Oort cloud really existed, or if the “clustering” was really a spike, as predicted by the exploded planet hypothesis. The published orbits of new comets have an orbit quality parameter, which indicates which orbits ought to be very accurate because of a long observed arc with lots of well-distributed observations (class 1A); and which orbits ought to have higher observational errors because of short arcs and/or fewer or poorly distributed observations (classes 1B, 2A and 2B). In the standard model with an Oort cloud of comets, there is no obvious way to tell the difference between comets anywhere in the energy parameter range on the left side of Figure 3. So there is no reason for any observational class of comet to be other than randomly distributed among all the comets in that figure. If all the orbits could be improved to class 1A, the overall average appearance of the distribution ought to be unchanged. However, in the eph, the real distribution would have all the comets in a single bin, and all the observed spread of energy parameter values would be due to observational error. So comets of observational classes 1B, 2A and 2B ought to have a broader distribution than class 1A comets because 1A comet orbits are closer to reality (less observational error). And if all the comets of classes 1B, 2A and 2B were improved to class 1A, the whole distribution should narrow greatly. Opik’s test was to separate comets of class 1A from the other classes to determine if the distribution was significantly broader for the other classes than for class 1A (indicating the eph is right), or essentially the same for both groups (indicating the Oort cloud is right). The results are shown on the left side of Figure 4 for new class 1A comets and on the right side of the same figure for new comets of classes 1B, 2A and 2B. The left side shows 2.6 times as many comets in the central spike as in the immediately adjoining bins combined. The right side shows only 0.8 times as many comets in the central spike as in the two adjoining bins, and has a clearly broader distribution. 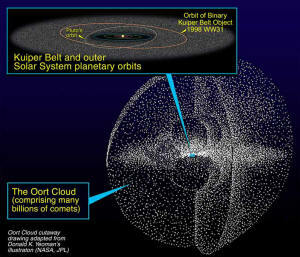 The Opik test is cleanly passed by the exploded planet hypothesis (eph), but not by the Oort cloud model. Anyone working with the published new comet data could arrive at the same conclusion. If skeptical readers suspect that the author may have consciously or unconsciously selected the data so as to give a favorable outcome, recall that Opik, who strongly doubted the eph when he thought of this test, came to the same conclusion even with the smaller amount of comet data available to him 20 years ago. Comets (at least most of them) acquired their extremely elongated, planet-crossing orbits by ejection in an explosion that we can now date at 3.2 million years ago. New comets are the continuing rainback of debris from that explosion. If asteroids and comets are the products of accretion from a nebula, or even from collisional break-ups, they will invariably be isolated single bodies because their gravitational fields are too weak to effect captures. For example, in a break-up event, most debris escapes, and what does not falls back onto the surface it was ejected from after one orbit. Even if it managed to barely miss the surface, tidal forces would bring it back down in short order. By contrast, in the eph, space is filled with debris just after the explosion. Large fragments will find lots of debris inside their gravitational spheres of influence, and these will remain in stable orbits as permanent satellites of these larger fragments. For that reason, I presented papers at the International Astronomical Union meeting in Argentina in 1991, and the Flagstaff meeting of asteroid, comet, and meteorite experts in that same year, pointing out the eph prediction. Specifically, spacecraft visiting asteroids (or comets) should find at least one of the larger debris bodies (satellites) in orbit around the asteroid (or comet) primary nucleus. This prediction, also published in[iii] and [iv], was considered extremely unlikely by mainstream astronomers, one of whom made a public wager with me that it would not happen. The Galileo spacecraft flew by asteroid Ida in 1993, and returned images showing a 1-km satellite (now named Dactyl) in a stable orbit around its nucleus. Since that discovery, two telescopic discoveries of satellites of other asteroids have been made. [v] This supplements occultation and radar evidence of long standing suggesting asteroid satellites. These would be easy to identify because of their tangential touchdown onto the asteroid, resulting in considerable rolling from their orbital momentum. So “roll marks” were the predicted identifier to show that boulders were former satellites. with a trail across a crater rim, leading to an interior boulder. 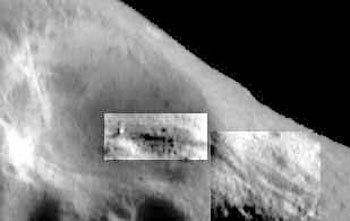 The first image taken by the spacecraft from orbit around Eros is shown in Figure 5. The two blocks are areas where contrast was stretched for better visibility of the “roll mark”. The image appears to show a track starting in a random location, going up the outside wall of a crater, down the inside wall, and ending in a 50-meter boulder. Many additional examples of boulders, tracks, and boulders at the ends of tracks can be seen in later spacecraft images. The largest of these secondary bodies is a 30-km satellite of an estimated 70-km primary nucleus. Another strong test distinguishing the eph from the standard models comes from comet split-velocity data. The eph leads to what I call the “satellite model” as an explanation of what a comet is and how it behaves. The standard model for comets is the so-called “dirty snowball” model. In the former case, comets are rocky asteroids surrounded by a debris cloud. In the latter case, they are a snow-ice mixture contaminated with dust packed into a lone nucleus that is eruptive when exposed to sunlight. It ought to be easy to distinguish these two extreme possibilities from observations. And indeed, it is. One of the strongest such tests follows. Some comets are observed to “split” into two or more comets. That was unexpected behavior in the dirty snowball model, but is explained after the fact as the breaking apart of the snowy nucleus under the action of strong jets. “Splitting” is required by the satellite model because, as the comet approaches the Sun and its gravitational sphere of influence shrinks, some outer satellites may find themselves outside the sphere of influence. Such objects then escape into independent solar orbits. The escape event will appear to a distant observer as a “split” of the comet into two or more pieces. The test involves the velocity of the fragment comets relative to the original comet from which they split. In the dirty snowball model, the velocity is the result of jet action. The energy source might be entirely internal to the comet, in which case the velocity of ejection of split comet fragments will be independent of the distance from the Sun at which the split occurs. Alternatively, the energy for the split in the dirty snowball model might come from solar light, solar heat, solar wind, solar magnetism, or something associated with the Sun. In all such cases, the energy ought to increase inversely with the square of solar distance, which will yield relative velocities that are inverse with solar distance to the first power. The dirty snowball model, because it does not predict such splits, is not specific about which mechanism, a solar or a non-solar energy source, is the correct one. Figure 6. Comet split velocities (V) vs. solar distance (R). shaded area is one sigma observational upper and lower bounds. By contrast, the eph and its satellite model require gravitational escapes of satellite comets as the sphere of influence of the primary nucleus shrinks upon approach to the Sun. The laws of dynamics require that “split” fragment velocities be escape velocities, which vary inversely with the square root of solar distance. Any other observed relationship would falsify the model. In Figure 6, we show a plot of split-comet component relative velocities, V, versus solar distance of the comet in astronomical units at the time of splitting, R, on a log-log scale. The data and its one-sigma spread lie within the shaded region. For comparison, three theoretical curves are shown, labeled “C”, “S”, and “E”. These represent a comet-internal energy source, a solar energy source, and gravitational escape energies as predicted by the eph, respectively. All curves have been shifted vertically to intersect at 1 au(about 150 million kilometers) because only the slopes are relevant. 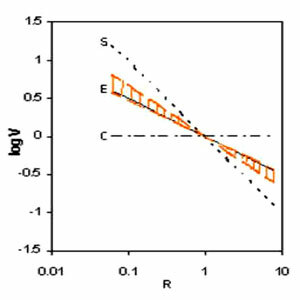 It is apparent that the theoretical curve predicted by the eph model falls within the one-sigma data region, and is therefore fully in accord with the observations. Both of the possibilities for the dirty snowball model fall well outside the data range by at least four sigma. This means the dirty snowball model is excluded as an explanation at the statistical level of better than 10,000-to-1. In summary, we see that the satellite model for the nature of comets, based on the eph model for the origin of comets, is consistent with the observational data; whereas the standard model is strongly excluded by the data. Planetary and moon explosions are not just a recent phenomenon. There is direct evidence for the explosion of one or more very large planets in the very early solar system. From studies of lunar rocks it is now known that the Moon, and presumably the entire solar system with it, underwent a “late heavy bombardment” of unknown origin not long after the major planets formed. In short, the late heavy bombardment, a real solar system event, sounds like an early planetary explosion event. The following documented geological events at the terrestrial K/T boundary at 65 Mya can easily be associated with a planetary explosion event, most likely the explosion of “Planet V” near the present-day orbit of Mars. This last point might need some clarification. If an event occurs at a great distance from the Earth, it would potentially affect just one hemisphere of the Earth if it is a quite sudden phenomenon. But if it lasts for more than 12 hours, as would occur for the spread in arrival times of a blast wave from a distant planet explosion, then the Earth would rotate on its axis, exposing most parts of the planet to the event. However, because of the tilt of the Earth’s axis to the mean plane of the planets, one polar region of Earth would remain continuously hidden from such an event unless its duration continued over many months. For the K/T boundary event, apparently one of Earth’s polar regions has shielded. This emphasizes the likelihood that the event was of distant origin and global extent, rather than terrestrial origin and concentrated mainly in one area (as for a single major impact such as the Chicxulub crater formation in the Yucatan). The above summarizes evidence that Mars was not an original planet, but rather a moon of a now-exploded planet occupying that approximate orbit. Many of these points are the expected consequences of having a massive planet blow up nearby, thereby blasting the facing hemisphere and leaving the shielded hemisphere relatively unscathed. Especially significant in this regard is the fact that half of Mars is saturated with craters, and half is only sparsely cratered. Moreover, the crustal thickness has apparently been augmented over one hemisphere by up to 20 km or so, gradually tapering off near the hemisphere boundaries. 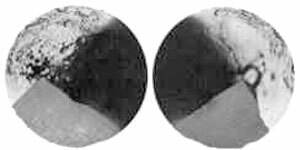 This “crustal dichotomy” is also readily seen in Martian elevation maps, such as in Figure 7. Figure 7. Mars crustal dichotomy. Cratered highlands (white), lowland plains (shaded). Left: western hemisphere, 180° à 0°. Right: eastern hemisphere, 360° à 180°. Putting all this evidence together, we have strong hints for two original planets near what is now the main asteroid belt: hypothetical “Planet V” and “Planet K”. These were probably gas giant planets with moons of significant size, such as Mars, before they exploded. We have hints of two more asteroid belts, probably from the explosions of two more planets (“Planet T” and “Planet X“) beyond Neptune. And we have hints for two extra-large gas giant planets, “Planet A” and “Planet B”, that exploded back near the solar system beginning. This model makes a major prediction that will soon be tested: Extrasolar planets should arise in twin pairs also, with 2-to-1 orbital period resonances common. If so, then many cases that now appear to be single massive planets on highly elliptical orbits will turn out, when enough observations are accumulated, to be twin resonant planets on near-circular orbits. We will mention three theoretical conjectures, although in-depth work must await a wider recognition of the phenomenon in the field at large. The earliest and simplest theoretical mechanism is that of Ramsey [xiv], who noted that planets must evolve through a wide range of pressures and temperatures. This is true whether they are born cold and heat up under gravitational accretion, or born hot and cool down by radiation of heat into space. During the course of this evolution, temperatures and pressures in the cores must occasionally reach a critical point, at which a phase change (like water to ice) occurs. This will be accompanied by a volume discontinuity, which must then cause an Earth-sized or smaller planet to implode or explode, depending on whether the volume decreases or increases. The second explosion mechanism, natural fission reactors, is currently generating some excitement in the field of geology. [xv] A uranium mine at Oklo in the Republic of Gabon is deficient in U-235 and is accompanied by fission-produced isotopes of Nd and Sm, apparently caused by self-sustaining nuclear chain reactions about 1.8 Gyr ago. Later, other natural fission chain reactors were discovered in the region. Today, uranium ore does not have this capability because the proportion of U-235 in natural uranium is too low. But 1.8 Gyr ago, the proportion was more than four times greater, allowing the self-sustaining neutron chain reactions. Additionally, these areas also functioned as fast neutron breeder reactors, producing additional fissile material in the form of plutonium and other trans-uranic elements. Breeding fissile material results in possible reactor operation continuing long after the U-235 proportion in natural uranium would have become too low to sustain neutron chain reactions. This proves the existence of an energy source in nature able to produce more than an order of magnitude more energy than radioactive decay alone. Excess planetary heat radiation is said to be gravitational in origin because all other proposed energy sources (e.g., radioactivity, accretion, and thermonuclear fusion) fall short by at least two orders of magnitude. 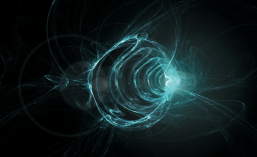 But these natural reactors may be able to supply the needed energy. Indeed, nuclear fission chain reactions may provide the ignition temperature to set off thermonuclear reactions in stars (analogous to ignition of thermonuclear bombs). The third planetary explosion mechanism relies on one other hypothesis not yet widely accepted, but holds out the potential for an indefinitely large reservoir of energy for exploding even massive planets and stars. If gravitational fields are continually regenerated, as in LeSage particle models of gravity [xvi], then all masses are continually absorbing energy from this universal flux. Normally, bodies would reach a thermodynamic equilibrium, whereat they radiate as much heat away as they continually absorb from the graviton flux. But something could block this heat flow and disrupt the equilibrium. For example, changes of state in a planet’s core might set up an insulating layer. In that case, heat would continue to be accumulated from graviton impacts, but could not freely radiate away. This is obviously an unstable situation. The energy excess in the interior of such a planet would build indefinitely until either the insulating layer was breached or the planet blew itself apart. Two additional successes and one additional new prediction will be mentioned briefly here. This refers to an obvious corollary of the eph, never explicitly put in writing in so many words. If meteorites come from the explosion of planet-sized bodies, the water from such bodies can be ocean water (as on Earth and as suspected for Jupiter’s moon Europa), and would therefore be expected to contain salt from run-off of minerals from solid portions of the planet. Only recently has meteorite water been tested for salt content for the first time, with the surprising result that sodium chloride was found. [xvii] Certain aspects of this discovery suggest that water was flowing on the parent body from which the meteorite came. “The existence of a water-soluble salt in this meteorite is astonishing,” wrote R.N. Clayton of the University of Chicago in the reference cited. True, unless one had the exploded planet hypothesis in mind. “In March, a long sodium tail was discovered in Comet Hale-Bopp. Aside from the general interest in this new type of comet tail, it was noted that the sodium ions have a half-life of just half a day, too short to survive a trip from the nucleus to the farthest parts of the tail. So the sodium must be conveyed as part of a parent molecule that is split by the solar wind into sodium and some other ions. The significance of this for comet models is that the exploded planet hypothesis says that comets originated in the explosion of a water-bearing planet. If that planetary water was salt water, as planetary oceans on Earth all tend to be, then water in comets would be salt water. Esko Lyytinen of Finland used the exploded planet hypothesis as a model for understanding and predicting the behavior of meteor storms. These had never before been successfully predicted. Although nearly a dozen professional astronomers attempted predictions for the possible November 1999 storm, only three teams had results that were correct for the time of the event, and only Lyytinen had both the time and the peak meteor rate correct to within the stated error bars. With the documented track record the eph has now established, it is small wonder that professional astronomers are no longer willing to make wagers with eph proponents about the outcome of either recent or future eph predictions. But sadly, research funding is still being poured almost exclusively into competitor theories. [i] T. Van Flandern (1978), “A former asteroidal planet as the origin of comets”, Icarus 36, 51-74. [ii] Z. Sekanina (1999), “Detection of a satellite orbiting the nucleus of Comet Hale-Bopp (C/1995 O1)”, Earth, Moon & Planets in press. [iii] T. Van Flandern (1993; 2nd edition 1999), Dark Matter, Missing Planets and New Comets, North Atlantic Books, Berkeley, 215-236; 178. [iv] T. Van Flandern (1992), “Minor satellites and the Gaspra encounter”, Asteroids, Comets, Meteors 1991, LPI, Houston, 609-612. [v] 3671 Dionysus (1997), Sci.News 152, 200; 45 Eugenia (1999), Science 284, 1099-1101. [vi] T. Van Flandern (1999), “Status of ‘the NEAR challenge’”, MetaRes.Bull. 8, 31-32. Also at <http://metaresearch.org>. [vii] T. LeDuin, A.C. Levasseur-Rigourd & J.B. Renard (1993), “Dust and gas brightness profiles in the Grigg-Skjellerup coma from OPE/Giotto”, in Abstracts for IAU Symposium 160: Asteroids, Comets, Meteors 1993, Belgirate (Navara) Italy, 182. [viii] E. Marchis, H. Bochnhardt, O.R. Hainaut & D. Le Mignant (1999), “Adaptive optics observations of the innermost coma of C/1995 O1: Are there a ‘Hale’ and a ‘Bopp’ in comet Hale-Bopp?”, Astron.Astrophys. 349, 985-995. [ix] P.R. Weissman (1989), “The impact history of the solar system: implications for the origin of atmospheres,” in Origin and Evolution of Planetary and Satellite Atmospheres, S.K. Atreya, J.B. Pollack, and M.S. Matthews, eds., Univ. of Arizona Press, Tucson, 247-249. [x] E.H. Christiansen & W.K. Hamblin (1995), Exploring the Planets, 2nd ed., Prentice Hall, Englewood Cliffs, NJ, 144. [xi] T.C. Van Flandern & R.S. Harrington (1976), “A dynamical investigation of the conjecture that Mercury is an escaped satellite of Venus”, Icarus 28, 435-440. [xii] R.S. Harrington & T.C. Van Flandern (1979), “The satellites of Neptune and the origin of Pluto”, Icarus 39, 131-136. [xiii] T. Van Flandern (1997), “The original solar system”, MetaRes.Bull. 6, 17-29. See also <http://metaresearch.org>. [xiv] W.H. Ramsey (1950), “On the instability of small planetary cores (I)”, Mon.Not.Roy.Astr.Soc. 110, 325-338. [xv] (1998), EOS 79 (9/22), 451 & 456. See also <http://www.ans.org/pi/np/oklo/>. [xvi] T. Van Flandern (1996), “Possible new properties of gravity”, Astrophys.&SpaceSci. 244, 249-261. [xix] E. Lyytinen (1999), “Leonid predictions for the years 1999-2007 with the satellite model of comets”, MetaRes.Bull. 8, 33-40; T. Van Flandern (1999), “1999 Leonid meteor storm – How the predictions fared”, MetaRes.Bull. 8, 59-63.